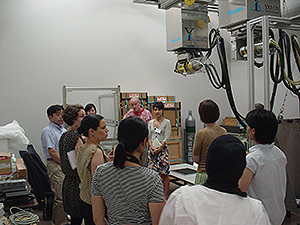 On August 30, thirteen visitors from ICCROM’s “International Course on Conservation of Japanese Paper” visited the Institute as part of their training session. They toured the Performing Arts Recording Studio in the Department of Intangible Cultural Heritage, and the Restoration Studio, the Conservation Laboratory, the Chemistry Laboratory and the Radiography Laboratory in the Center for Conservation Science and Restoration Techniques. The Institute usually hosts international symposia, and this year the Institute will host a symposium on the topic of Reconsidering “Form”: Towards a More Open Discussion. The symposium consisted of 3 sessions: “Forms”as Groups, “Forms”as Individual and That which Supports“Form”. The symposium will include research on form in the various field, such as fine art, archaeology, and architecture. We also target at the form in the traditional performing arts, and classic literature. The symposium seeks to explore new avenues of discussion presented by the methodologies used in those fields. The symposium covers a wide range of topics, so presenters were invited to participate in a seminar as groundwork for a discussion. To start with, Kouji KUWAKINO (Osaka University), who will be making a presentation during the 3rd session, visited the Institute, and a seminar took place starting at 3 PM on August 2nd. Mr. KUWAKINO gave a talk on Early Modern Italian Gardens and Mnemonic Devices. Using the garden at the Villa di Castello, built on the outskirts of Florence in the 16th century, as an example, Mr. KUWAKINO described the deciphering of forms using mnemonic devices, which flourished in Western Europe from the 15th to the 17th century. The 15th century marked the start of the Age of Exploration and printing technology was invented, leading to a rapid increase in the quantity of information. Mnemonic devices were developed to organize and store that information, and ideas that linked information and certain forms spread. Those ideas are even reflected in buildings and gardens. This stimulating seminar examined part of the context for forms. Hozan-ji in the City of Ikoma, Nara Prefecture has a number of noh texts written by Zeami, himself in 14th century. Those texts include some musical notes alongside verses. Those notes were examined in detail, providing clues to how Zeami composed the works. 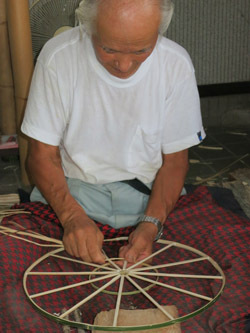 From August 21st–22nd, sedge hat-making techniques (nationally designated as an Intangible Folk Cultural Property in 2009) passed down in the former town of Fukuoka (now part of the City of Takaoka), Toyama Prefecture were studied. Sedge hats were originally a folk implement that was ordinarily used as protection from the sun or as rain gear. Today, however, these hats serve as props in folk performing arts or period dramas (especially those about feudal Japan) or as folk decorations. Sedge hats in Ecchu-Fukuoka were known as “Kaga Hats” since the days of Japan’s feudal domains, and these hats enjoyed wide use because of their high quality. Today, Ecchu-Fukuoka accounts for 90% of the output of sedge hats nationwide, making it the premier site of hat-making. Sedge hat-making is divided into several steps: growing sedge (the raw material for a hat), making the hat’s framework, and sewing the hat (sewing sedge onto the hat’s framework). In the past, men made the hat framework while women sewed the hat as a sideline activity during the off-season. The steps of sedge growing and making the hat framework in particular are seriously suffering from a lack of individuals to carry on the technique. As an example, the number of individuals who cultivate sedge fields completely by hand is decreasing yearly. According to a survey by the Association to Preserve Ecchu-Fukuoka Sedge Hat-making Techniques, the area of sedge growth in the city has shrunk to less than 100 ares (1 hectare). During the heyday of sedge hat-making, there were around 200 craftsmen who made the hat framework, but currently Mr. KIMURA Shoji, a craftsman in his late 80s, is the only craftsman still doing so. The current reality is that not enough people have been trained to carry on the technique, so supply is unable to keep up with existing orders. In light of these circumstances, the Association to Preserve Ecchu-Fukuoka Sedge Hat-making Techniques and the City of Takaoka’s Fukuoka General Administration Center have led the charge with comprehensive steps to pass on sedge hat-making techniques. A wide range of activities have been used thus far to pass on the culture of sedge hats, including efforts to ascertain the area of cultivated sedge fields, efforts to create records of the cultivation of sedge fields (a manual), discussions with hat makers, sales demonstrations, workshops to teach hat-making, and identification of companies to make needles to sew sedge hats. In August 2012, the Committee to Preserve Sedge Hat-making was established, and in August 2013 the Ecchu-Fukuoka Sedge Growers Association was established. These organizations are transcending boundaries as they liaise with the Regional Development Section and the Economic Development Section, the Fukuoka Educational Administration Center, the Cultural Properties Division, and the Agriculture and Fisheries Section (this section is heavily involved in sedge growing). Designation of folk techniques as an Important Folk Cultural Property began in 2005, but the preservation and utilization of these techniques has not been fully discussed. Information on the issues involved, steps to take, and the feasibility of those steps was not been adequately shared. 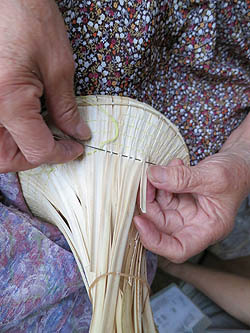 The various efforts to preserve sedge hat-making techniques in Ecchu-Fukuoka warrant close attention as a case study involving the preservation and utilization of folk techniques. The 3rd training course in architectural surveying was conducted over a 2 week-period from July 22 to August 2 at the temple of Ta Nei at Angkor in Cambodia. This training is planning for younger staff members of the Authority for the Protection and Management of Angkor and the Region of Siem Reap (ASPARA), the National Authority for Preah Vihear (NAPV), and JAPAN-APSARA Safeguarding Angkor (JASA, a team combining the Japanese Government Team for Safeguarding Angkor and the ASPARA), which are all responsible for managing ancient monuments in the Kingdom of Cambodia. The participants are specialists in architecture and archaeology, and in this 3rd course nine trainees including 1 new staff participated. As we finished recording the temple layout within the first and second enclosure walls by the previous courses, the 3rd course began with a traverse survey for making reference points to measure architectural remains and topography within the third enclosure wall. By using these points as reference also for a topographical survey that included the third enclosure wall with the east and west gopuras and the moat outside of the second enclosure wall. The trainees were divided into 2 groups to conduct the survey, and in the end, all of them could create a contour map and a 3D model of the area within the third enclosure wall by using these measuring data. The trainees appeared to be highly motivated to take on challenges: as the trainees who had attended the previous courses had almost mastered basic steps in surveying architectural remains and plotting, they could teach to their fellow trainees even when they encountered something they did not know. In addition, on the final day of the course, all of the trainees gave presentations on the topic of surveying and drawing of architectural remains for the conservation, describing their own part in site work and exchanging opinions on the prospects for the future. 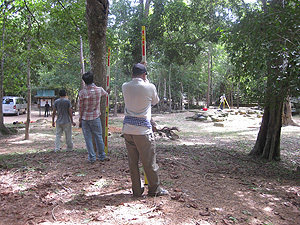 This training course is not simply to provide technical methods in archaeological surveying from Japan to Cambodia. 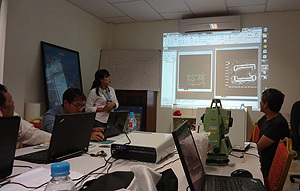 Rather, the course has also steadily encouraged exchanges among Cambodian trainees themselves. We continue the cooperative projects with the hope that younger personnel who will be responsible for the future of sites in Cambodia grow through such efforts.